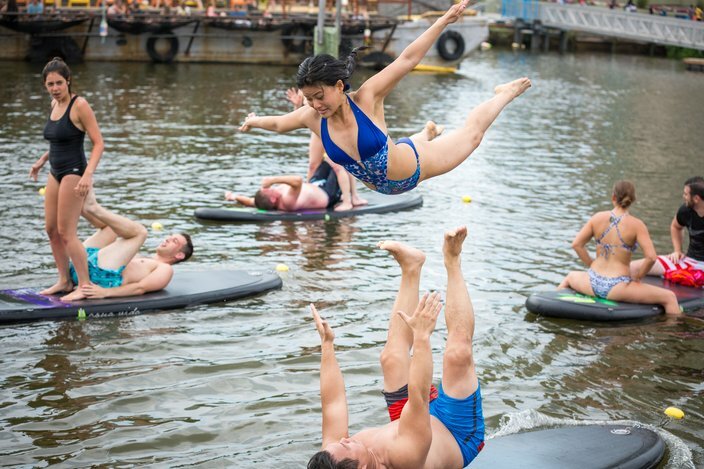 Maybe one of the best ways to fall in the Delaware? Julia Nield and partner Anthony LaFrance practice "high bird," an AcroYoga pose, while on a dock at the Penn's Landing marina for a stand-up paddle board AcroYoga class (referred to as SUP Acro), that was held at Aqua Vida. Stand-up paddle board AcroYoga, or SUP Acro, is a relatively-new blend of a few movement and balanced-based activities, combining acrobatics and the practice of yoga, while stacking it on top of a floating paddle board. If that seems relatively straight forward to you, go try it – you'll be in the river in no-time! But that's part of the fun of SUP Acro – it challenges you mentally and physically, all while making sure you take a needed swim-break every few minutes. 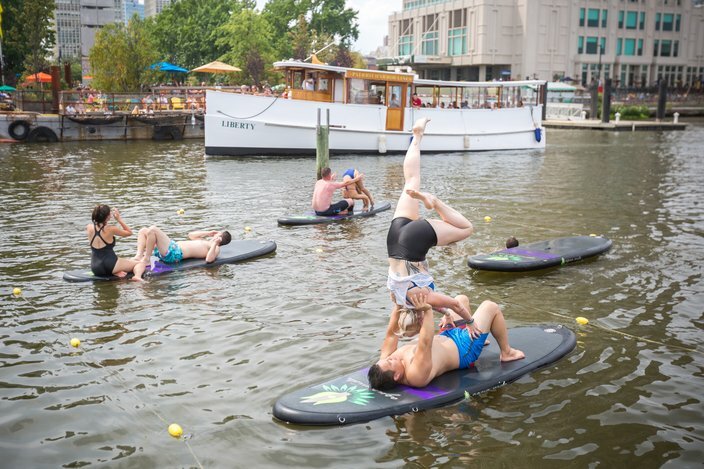 You can try out SUP yoga or SUP Acro by visiting Aqua Vida – look for a 30-foot sailboat that is tucked into the Penn's Landing Marina. Created and run by Jana Mars, Aqua Vida offers dozens of classes each week that range from Flow to Yin classes, paddle board tours and clinics for kids. 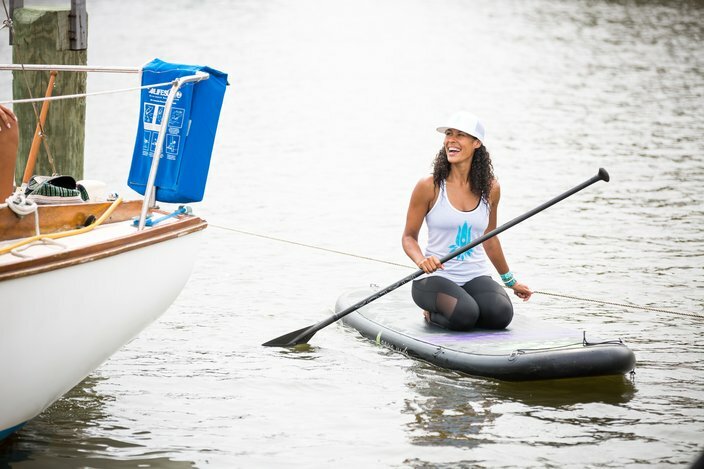 Aqua Vida has also proven to be committed to helping the environment by teaming up with the Philadelphia-based United By Blue to host river cleanups and tours where 100 percent of the proceeds go to water conservation efforts. Below is a series of photos from a recent SUP Acro jam at Aqua Vida. Cindy “Fly” Claudia gets launched into the air by Robert Li. 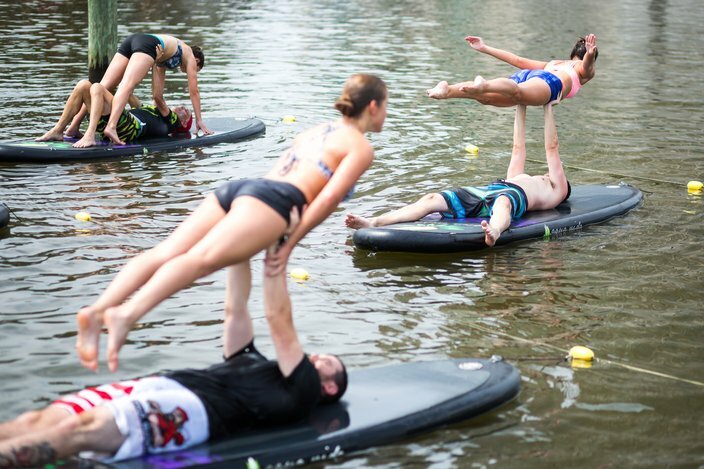 SUP Acro requires concentration, balance and core stability more than overall brute strength. Straight arms and legs allow the skeleton to distribute the weight rather than requiring muscles to hold positions. 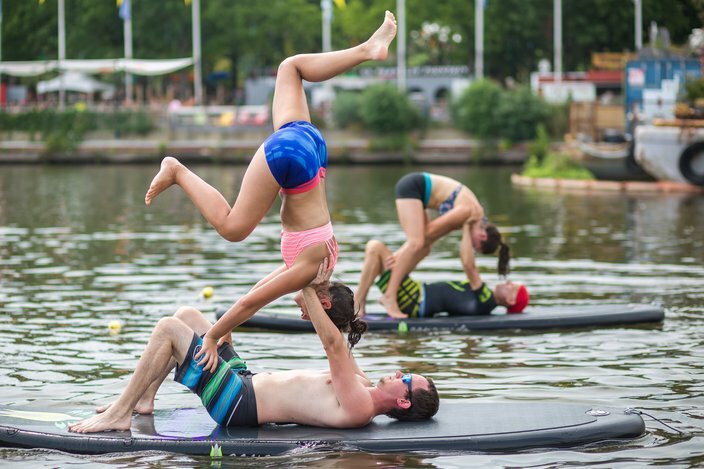 AcroYogis practice “low bird” while balancing on Aqua Vida's paddle boards. Jana Mars, owner and creator of Aqua Vida, floats near her boat in the Penn's Landing Marina during a recent SUP Acro class. 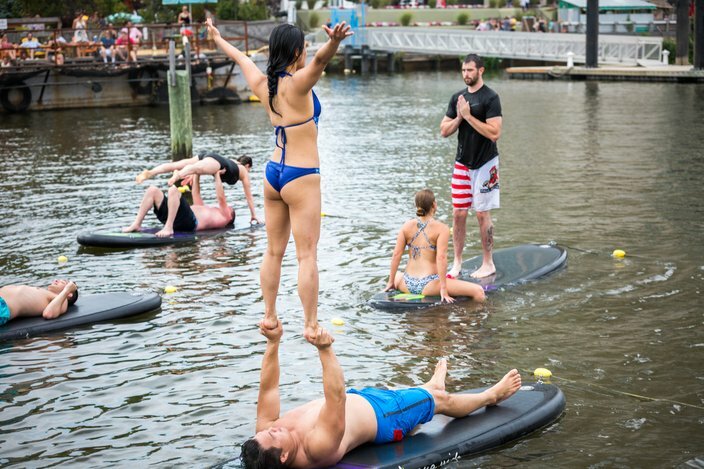 Instructor of SUP ACRO, Robert Li, practices a version of shoulder stand with an instructor from Aqua Vida during a class at the Penn's Landing Marina. Julia Nield and Anthony LaFrance work on “low bird” an AcroYoga pose while balancing on a paddle board. Cindy Claudia and Robert Li work on “foot-to-hand,” a pose that gets exponentially more difficult on a paddle board.